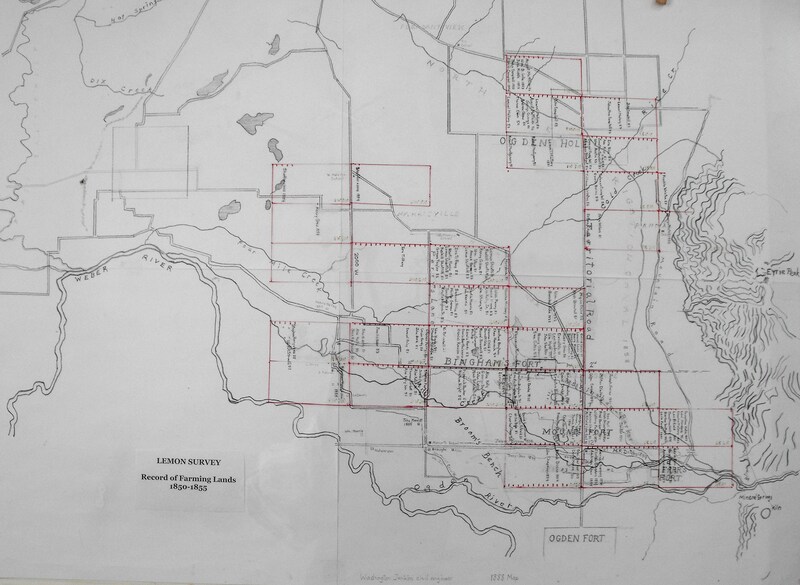 In 1850 the land north of the Ogden River was surveyed into blocks 1/2 mile wide by 1 mile in length. Potential streets ran every mile north and south and every half mile east and west. This land was designated as the Farming Lands and each block was divided into 16 twenty-acre farms. For a few years the farm land claims were free. 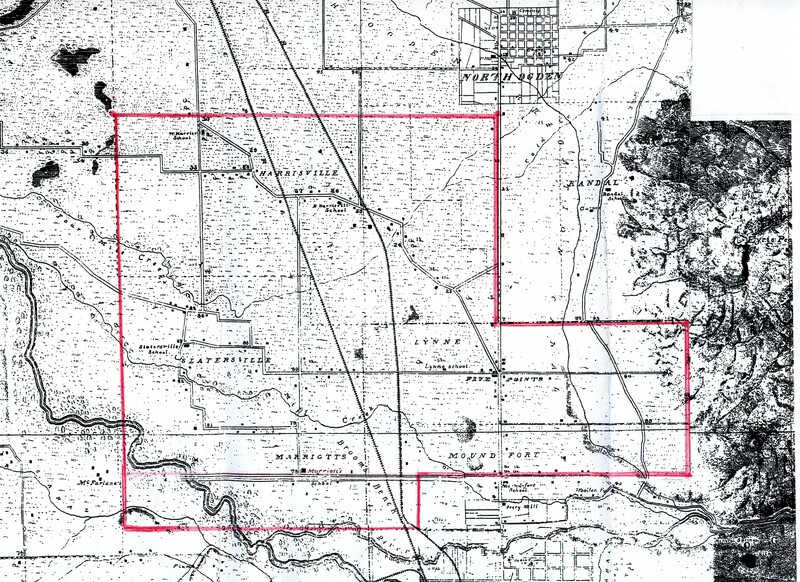 In 1856 the Farming Lands were divided into the Bingham’s Fort District, North Ogden District, and Farr’s Fort District. At this time Ogden City’s boundary was moved from the Ogden River to 12th Street annexing the Farr’s Fort District. The red lines roughly indicate the boundary of the Bingham’s Fort District. Home builders flocked to the Bingham’s Fort District, an area of rich soil and many irrigation ditches that made it a choice place to settle. The district was gradually divided into 4 communities through the organization of Church branches, schools and post offices. In 1864 the Precincts of Lynne and Slaterville were created from the Bingham’s Fort District. The Harrisville Precinct was organized in 1868, and Marriott remained part of the Lynne Precinct until 1878 when it separated. Following are some log cabins, adobe houses, burnt brick houses and brick houses built by various pioneers in the Bingham’s Fort District. Richard C. Roberts and Richard W. Sadler, History of Weber County, p. 61,68, 69, 172; Andrew Jensen, Slaterville Ward History, 1893, manuscript, p.1; 1860 census; History of Marriott, 1935, posted at http://www.johnmarriotths.org.